PC users are always looking for ways to speed up their systems, looking for that one magical setting to make everything run smooth, fast and stable. Unfortunately, there is no single magical setting. There are many factors that go into making your PC faster using your current hardware. Sure, you could spend hundreds of dollars to upgrade to the fastest, newest hardware, but we want to get the most for our money and our existing hardware. For that, there is a program called TuneUp Utilities. 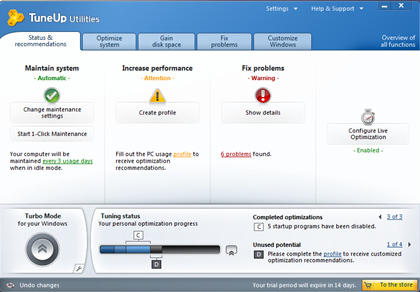 I will be reviewing their latest version, TuneUp Utilities 2011 today. 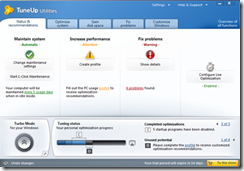 TuneUp Utilities packages multiple tools into one package, allowing you to get the most performance from your PC with very little work. Of course, that is the claim. I aim to see if this is in fact true, if there are any noticeable improvements in speed and usability. I have never owned or used an all-in-one maintenance tool for my PC, this will be my first experience with one. Setup is very simple, very similar to other applications. Once the initial setup is complete, you are presented with a 1-Click Maintenance window. You can run an initial scan that cleans and defragments your registry (registry defragging is still considered snake oil by some), deletes temporary files, fixes broken shortcuts and defrag your hard drive. 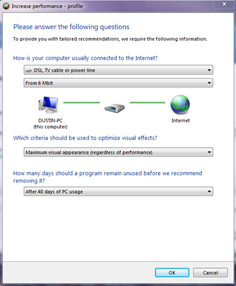 The main window of the program has five tabs to help you tune your PC for maximum performance, as well as scheduling routine maintenance. The Tuning status can help speed up your system using tweaks and registry changes. You go through a series of questions that help the program improve system and network speed. It also suggests which programs to remove if you haven’t used them in a selected period of time. There are programs on systems that you run once and are done, but they still sit there using system resources. The people at TuneUp have tested thousands of programs, installing and uninstalling to find out which ones use the most resources and how much performance you gain by uninstalling the program. 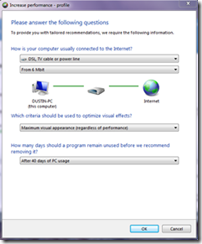 The Program Deactivator can enable and disable certain programs that present a higher load on your system. You can disable the high load programs until they are needed to gain more speed. Another great feature that I love about this program is the Live Optimization, which increases the priority of your running program to make it a bit faster. This does its work on the fly when your application needs more CPU resources. The built in Turbo Mode shuts down certain processes to make your PC faster, which comes in handy when you are playing a game or other high processor use. It does things such as shut down automatic defrag, automatic updates, device detection, media sharing, and other resource hogs. Does this really speed things up? In theory, yes. I didn’t notice any FPS gain at all, but for those that could use the extra few percent increase in speed, it may be worth it. 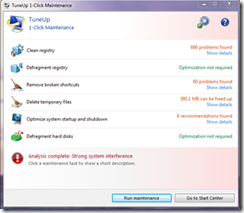 So, does TuneUp Utilities really make your system faster? In short: yes. It frees up RAM by disabling programs that you don’t use, clears your temporary files, defrags your hard drive, and fixes errors that cause problems. Yes, you could do this by yourself, but it would take many hours to get everything the way that TuneUp does it, using quite a few separate programs. TuneUp Utilities does this all automatically, in the background after the initial setup. I take care of my system using several different tools, which are supposed to do the same thing that TuneUp does, but there were still quite a few issues that TuneUp was able to diagnose and fix. There are many settings to tune your performance using the program, and it can take quite a while to manually do everything to your liking. The good part is that the automatic optimization works very well. Yes, TuneUp Utilities costs around $50USD, but the money is well spent. The amount of time that is saves is well worth the money (time is money, they say!). There are a lot of places that try to sell you programs that do the same thing, but with a lot less features, commercials on television that promise to make your PC faster, but TuneUp Utilities delivers on that promise. My first thought of this program, like the others, was that it was a lot of snake oil, that makes you think your PC is faster, but nothing really improves. I was proven wrong this time. 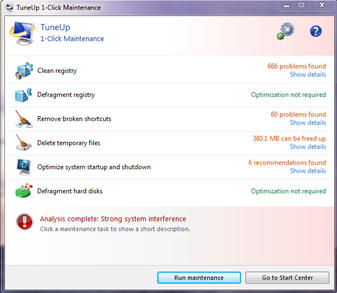 There are many ways to make your PC faster, and upgrading hardware is usually #1, but to get the most of your current hardware, I recommend a software product like TuneUp Utilities.